Jobs Description: Army Force Institute of Nutrition Lahore Cantt Jobs 2018 are listed below in our site. 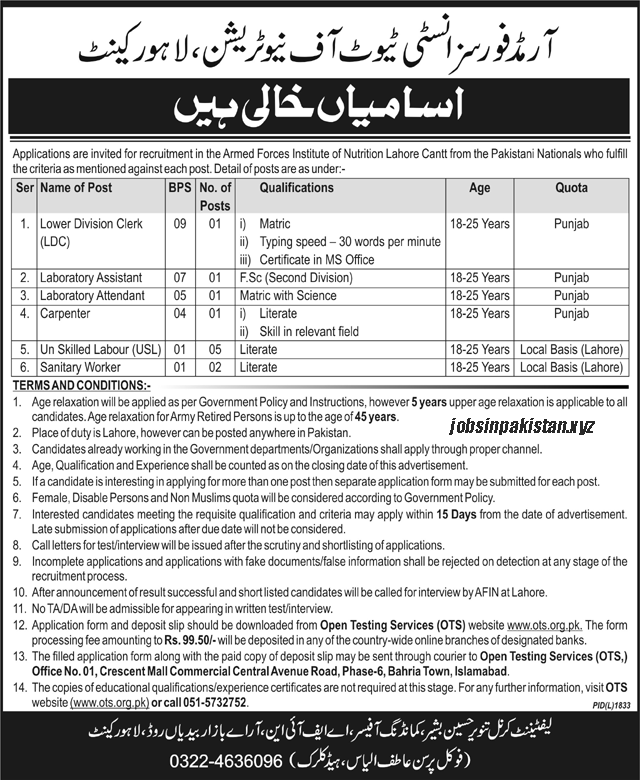 Pakistan Army Department of Nutrition Lahore Cantt recently announced an advertisement for empty vacancies. Pakistan Army is one of the biggest and powerful armies in World. Pakistan Armed Force Institute of Nutrition Lahore Cantt has required the applications for following jobs. 1. Age relaxation will be applied as per Government Policy and instructions, however, 5 years upper age relaxation is applicable to all candidates. Age relaxation for Army Retired Persons is up to the age of 45 years. 2. Place of duty is Lahore. however can be posted anywhere in Pakistan. 3. Candidates already working in the Government Departments / Organizations shall apply through proper channel. 4. Age, Qualification, and Experience shall be counted as on the closing date of this advertisement. 5. If a candidate is interested in applying for more than one post then separate application form may be submitted for each post. 6. Female, Disabled Persons and Non-Muslims quota will be considered according to Government Policy. 7. Interested candidates meeting the requisite qualification and criteria may apply within 15 Days from the date of advertisement. Late submission of applications after the due date will not be considered. 8. Call letters for test interview will be issued after the scrutiny and shortlisting of applications. 9. Incomplete applications and applications with fake documents / false information shall be rejected on detection at any stage of the recruitment process. 10. After the announcement of the result, successful and shortlisted candidates will be called for interview by AFIN at Lahore. 11. No TA/DA will be admissible for appearing in written test interview. 12. Application form and deposit slip should be downloaded from Open Testing Services (OTS) website www.ots.otg.pk. The form processing fee amounting to Rs.99.50/- will be deposited in any of the countrywide online branches of designated banks. 13. The filled application form along with the paid copy of deposit slip may be sent through courier to Open Testing Services (OTS,) Office No. 01, Crescent Mall Commercial Central Avenue Road, Phase-6, Bahria Town, Islamabad. 14. The copies of educational qualifications/experience certificates are not required at this stage. For any further information, visit OTS website (www.ots.org.pk) or call 051-5732752.